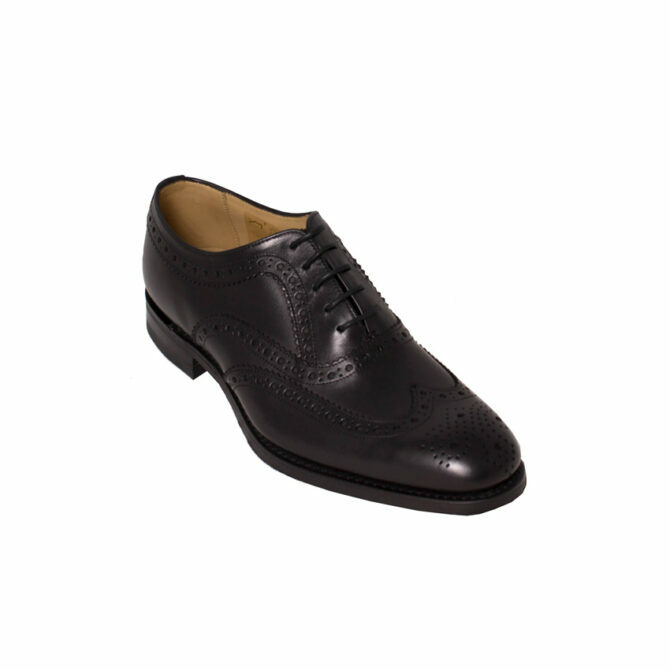 The Loake Shoemakers Bovey; a black calf leather oxford brogue. Ideal for work or the weekend. Finished with a Goodyear Welted Loake Rubber Sole. Fully leather lined and in soles. Worked on the Claridge Last, G Fitting. Bowhill and Elliott are proud stockists of Loake Mens shoes, and stock styles such as the Loake 1880 and the Loake boat shoe. If you’re looking for Loakes Shoes, we offer a customer service that we believe is second-to-none, with nearly 140 years of fitting and selling the right shoe to the right customer. We list our shoes in UK sizes, but if you have any concern at all about sizing for the Loake Shoemakers Bovey, we would be more than happy to answer your queries via email at info@bowhillandelliott.co.uk or by phone +44 (1603) 620116. Bowhill and Elliott are proud stockists of Loake Mens shoes, and stock styles such as the Loake 1880 and the Loake boat shoe. If you're looking for Loakes Shoes, we offer a customer service that we believe is second-to-none, with nearly 140 years of fitting and selling the right shoe to the right customer.